Challenges - RIP and 100 books. Isn't this cover a little scary? I am drawn to the picture constantly, I find it absolutely intriguing. Now anyone who has read my blog from the beginning, will know how much I have come to love Joanne Harris over the year. To me, she is a master of storytelling. I actually enjoy her earlier books which are all Gothic thrillers, more than her recent books. Many of the ones I have fallen in love with, were only re released due to public demand. 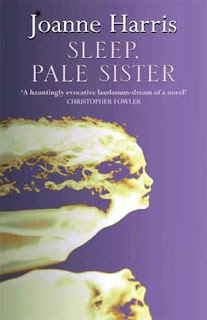 Sleep, Pale Sister is one her Victorian Gothic thrillers at it's best. The book begins with Henry Chester, a Victorian artist, who dominates the life of his young innocent wife. Henry has a dark secret, which when revealed leads to his destruction. His wife Effie, was his child prodigy at the age of ten and his wife by the time she enters her teenage years. Henry is desperate to keep her pure and the only way he can do this is by keeping her drugged continuously on laudanum. As Effie matures, she takes on a lover, Mose, who in an attempt to blackmail Henry, he introduces Effie to Fanny Miller, a brothel keeper, whose daughter was murdered ten years ago on the day of Henry's visit to the brothel. I found this book very dark and a little bit disturbing. I don't enjoy reading about young girls marrying men older enough to be their fathers and then being treated like children. I didn't enjoy it in Rebecca and I felt that this book takes it to the extreme. The relationship between Henry and Effie is beyond weird. In this day and age it would not be allowed. The fact that he keeps Effie drugged permanently to stop her just being herself, is just plain sick. However, Effie does get her revenge and I think that is what kept me reading. In the end, she really does get her own back on Henry, though unfortunately she never gets to reap the benefits of her actions. The book has a clairvoyant feel to it. There are plenty of references to gypsies, crystal balls and the calling of spirits. Each section of the book is titled to lay out like a tarot card reading. I loved the setting of this book and really enjoyed the dark and sinister atmosphere the book gave off. Joanne Harris is superb at creating this Gothic imagery. As I mentioned before, the only thing I didn't enjoy was the relationship between Henry and Effie, but that is purely a personal thing. If you have not read any of Joanne Harris's earlier works which are set in Victorian London, then I really do suggest you try this one or 'An Evil Seed'. I am really getting into the Victorian Gothic novel. Can anyone recommend any good ones they have read, that I might like. I've only read Chocolat - these both sound my sort of thing... apart from the obvious bit that mention. I'm the same :) Think it might be because I have girls myself. Oooh Vivienne, thank you! I've never heard of this book before, but it sounds so good! Also a fan, this is also one of my favourires - it's so dark and moody. This cover is very scary looking (my copy is different). I have not read this book, but I was looking forward to it. Sorry I can't think of a good Victorian Gothic to recommend--i like those too. This sounds really creepy! I have this book but haven't read it yet. Oh I totally know what you mean by the creepy feeling of older men with younger women. I'm getting that feeling with Her Fearful Symmetry and I just don't like it. Arg. The cover is great, but I'm not sure the book is for me. I don't like disturbing too much. Ooh, you're right about the cover's appeal, and the story sounds intriguing! That sounds creepy! I recommend Fingersmith by Sara Waters. You might like that. I need to read her books soon. I have a couple in my TBR. Thanks for highlighting this one! I've never read a book by Joanne Harris but this one just got added to my TBR list. Great job!